With two and a half weeks left, we've got one important update for you: there is a change in venue for the Friday night Celebration Banquet. The Banquet will now be held at the Family Life Center of the Baptist Church on Main Street in Cross Plains. It's a well-labeled building that is hard to miss, just north of the downtown section. This change will provide more space for both the Banquet and the Silent Auction held at the same time. And more importantly, the caterer is happy, so: happy cook, happy...well, the chicken fried steak will taste a little extra special this year. There are still seats left at the Banquet. $15.00 per person will do the trick, sent to Project Pride, POB 534, Cross Plains, TX 76443 or via Paypal at ProjPride@yahoo.com. Our panel presentations this year will be extra special as well. Fred Malmberg, Jay Zetterberg and Steve Booth from Cabinet Entertainment will be on hand with all of their REH-related updates coming down the pike. Robert E. Howard is hitting the big time in the form of multi-media entertainment. New books, new games and new television presentations featuring REH characters are being planned to really get the Howard name and brand to more people. Patrice Louinet will be here to talk about the ongoing Howard publishing being done in France, along with some exciting Howard-related gaming news. There'll be gaming presentations at the Cross Plains Library as well as notable Howard Heads on hand there for your question-answering pleasure. We'll be hearing about these events and more at our panel presentations, but all the Howard Heads will be available all weekend all over town to answer your questions and keep things exciting. Speaking of books, looks like the newest offering from the REH Foundation Press will be available for the first time at Howard Days. 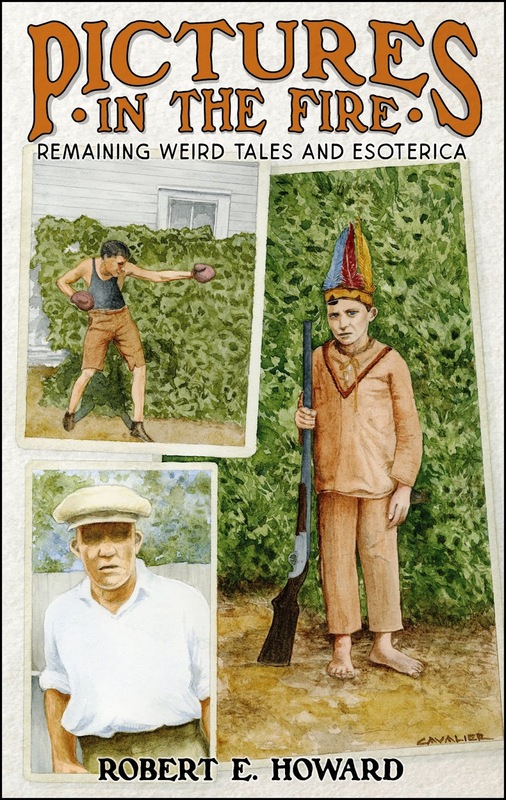 Pictures in the Fire, Remaining Weird Tales and Esoterica, should be front and center under the Foundation Press canopy set up just east of the Robert E. Howard Museum. This book features a cover by Bill Cavalier, who is also the 2018 Howard Days Guest of Honor. It will include REH stories, poems, letters and well, esoterica not yet published. So, the time for Howard Days is drawing near, but there's still plenty of room for y'all to come! Hope to see you there!